Really wasn't feeling yesterday's yellow and, no matter what I did - sandpapering, aggressive washing up (not my job, you see), picking at things, etc - I just couldn't put a dent in it. This further proves the theory that the amount a polish-job is liked is inversely proportional to the amount of times it lasts. Somewhat annoying. Horrible picture of two coats of La Femme Ice Blue Cream. Not sure what happened with the pix as they all came out all blurry - probably an operator issue (hides most of the horrible cuticles though, sorry bout them). But, yes, La Femme Ice Blue Cream is a pastel blue creme that should have been worn sooner (had it ages). Didn't go on too badly and it looked good enough to go at two coats. Have to say that I am quite impressed with the pigmentation on these La Femme Creams, the colours so far have been pretty fab and a pleasure to look at. 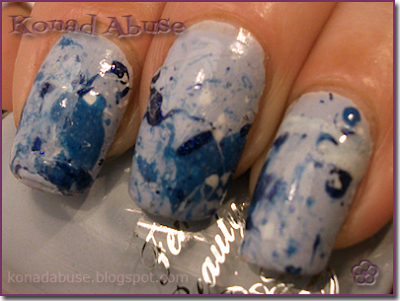 Which eventually happened and I thought that I'd give the splatter mani on Jessica's Nail Art a go. It was a right pain to begin with, as I had no joy with a straw and had to go through a number of household implements and the contents of the Stuff That'll Will Come In Handy drawer. Eventually got the splattering to work by using the outer shell of one of those pound-shop pens that work for 20 seconds then conk out. 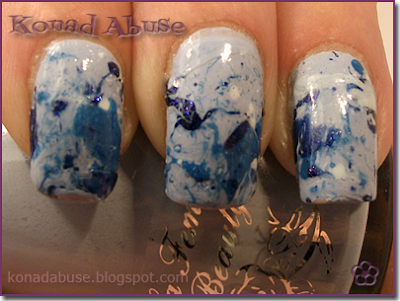 I sellotaped my fingers up, splattered La Femme Blue Cream (medium blue) and Orly Lunar Eclipse (darker blue with shimmer) and Barry M Matt White everywhere and made a lumpy mess on my nails. It was all looking a bit dodgy but a couple of coats of top-coat eased the lumpiness and made everything sunshine and bunnies.